When a client visits a resort or day spa, they are often there to enjoy a full-body or specialty massage. Reclining on a narrow table with a thin mattress is part of the process in order to permit the massage therapist access to a client’s body from all sides. Of course, a clean and comfortable massage table fitted sheet is required on the mattress in order to prevent contamination from lotions and emollients that the therapist uses to make the massage relaxing and soothing. A massage for one client might last 20 minutes to an hour, and this means that a therapist has numerous clients each day. Just one massage therapist might need 10 or more sheets each day for a massage table’s mattress, and if a day spa or resort has several therapists, then it requires hundreds of sheets on a daily basis. The linens required for massage tables are a particular size, and to ensure it stays in place on the thin and narrow mattress, it requires precise measurements. It isn’t easy to find the proper supplies needed for resorts or spas, and many stores do not sell this product. When a business manager is able to find luxurious and affordable sheets for massage tables, they should order as many as possible to have ready for clients. 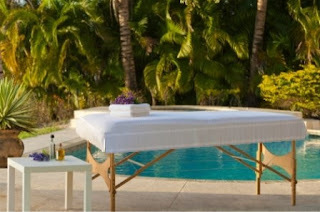 Today, massage table fitted sheets are made of microfiber instead of cotton, making the items faster to wash and dry. The polyester fibers in the sheets are designed to last longer than cotton fibers. This microfiber is as soft as silk, creating a comfortable surface on massage table mattresses. While 100 percent cotton sheets become extremely wrinkled in a dryer, microfiber sheets are almost wrinkle free. Each sheet is made with deep pockets and is completely surrounded with covered elastic to keep the fitted sheet in place during massages. The fitted sheets are made of basic white fabric to combine with flat massage sheets that are designed for draping clients. Sign up now to have news and deals delivered to your inbox!